When you have young children, it can feel like you're not really getting anything done all day. I often joke with my husband that I spend my days moving stuff around (back to where it belongs). Even if you start the day with a plan, it is SO EASY to get thrown off track. One child wets the bed, so there's an extra load of laundry and sheets to change. An unexpected doctors visit throws you off. You realize you're out of milk and need to make a quick run to the store. Your kids destroy the room you just picked up. Little people keep eating all the food you make! It's easy to feel like you're spinning your wheels. On those kinds of days, I remember the advice of a friend I worked with before I started staying home with my girls. She had just returned to teaching after staying home with her children while they were young. 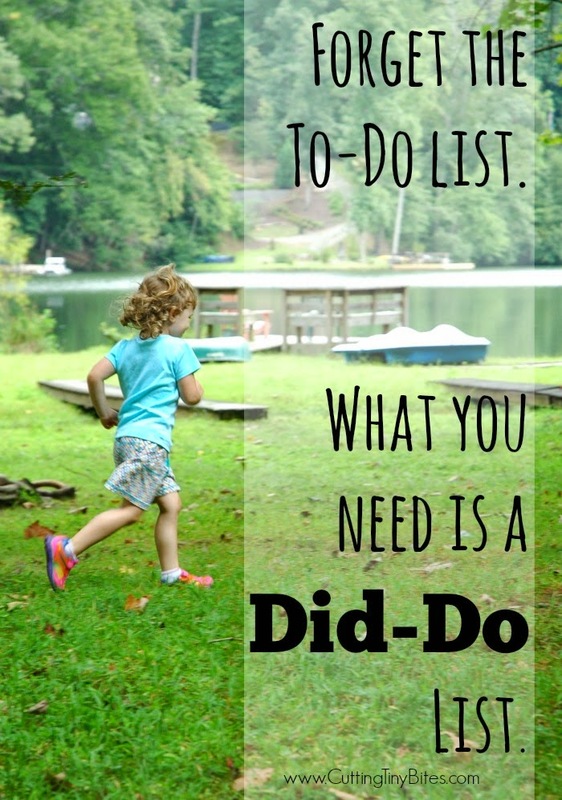 She suggested making a "Did Do" list in the evening instead of a "To Do" list in the morning. Before you collapse into bed, feeling frustrated and overwhelmed, take a moment to remember all that you've accomplished in your day. You nursed the baby 8 times. You got 3 children dressed. You provided meals for 4 people (and maybe you even got some of the dishes done)! You took a nap and caught up on some much needed and deserved rest. You read bedtime stories to your kids. You kept your children clean and comfortable by changing a dozen diapers. You played Candy Land and modeled good sportsmanship to your preschooler. You made your kids laugh. You gave 100 hugs and 300 kisses. You charged your batteries by enjoying your coffee on the porch by yourself. You fetched Band-Aids. You stared into your baby's eyes and made him feel loved and secure. Even if you haven't done a lot, pat yourself on the back, Mama. You've DONE A LOT! Give yourself some grace. What you are doing is important, even if you can't cross it off a list or put a satisfying check-mark beside it. Go to bed feeling good about what you're doing. Encouragement for moms of young children. Stop focusing on what you didn't get done, and appreciate the important things that you ARE doing!